Look out of this world in our awesome glow-in-the-dark t-shirt! 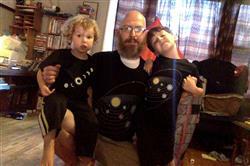 If you have a budding astronomer, this retro solar system shirt is sure to please! This astronomy-inspired design celebrates our solar system during the time in human history when we still had 9 planets. From 1930-2006, Pluto inhabited our hearts, minds, and the mnemonics of school children, as it was considered one of the major planets in our solar system. Though this oddball planet held strong as a member of the Big 9 for 76 years, it didn’t even make one orbit around the sun (since that takes 248 years) before it was downgraded to a dwarf planet. We still have a lot of love for it, so we included in our design. 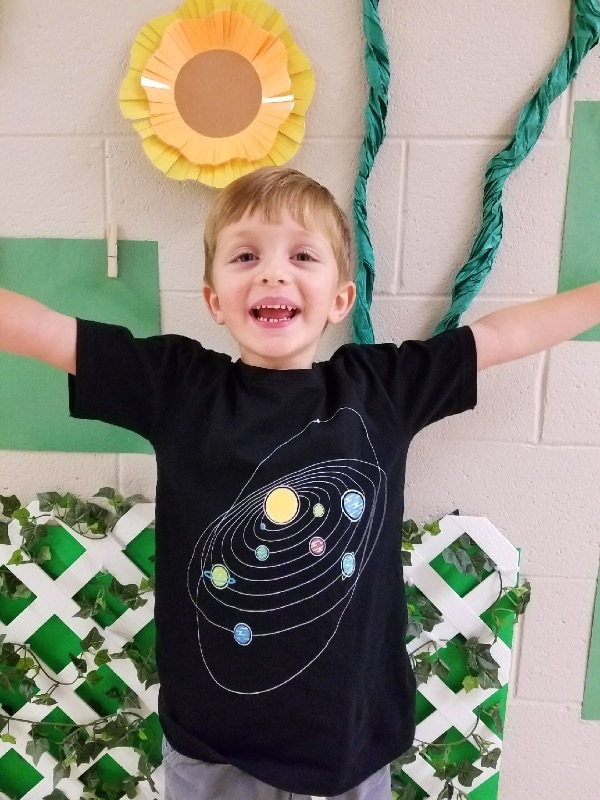 This solar system kids’ shirt glows in the dark, since planets just look cooler at night! 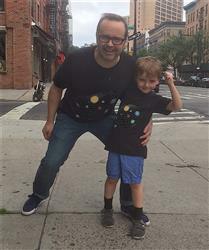 This black organic cotton, short-sleeve kids' t-shirt is screen-printed with glow-in-the-dark retro solar system with orbitals design. Available in kids' size 2 years -11/12 years. My son received this as a gift and loves it. Highly recommend. 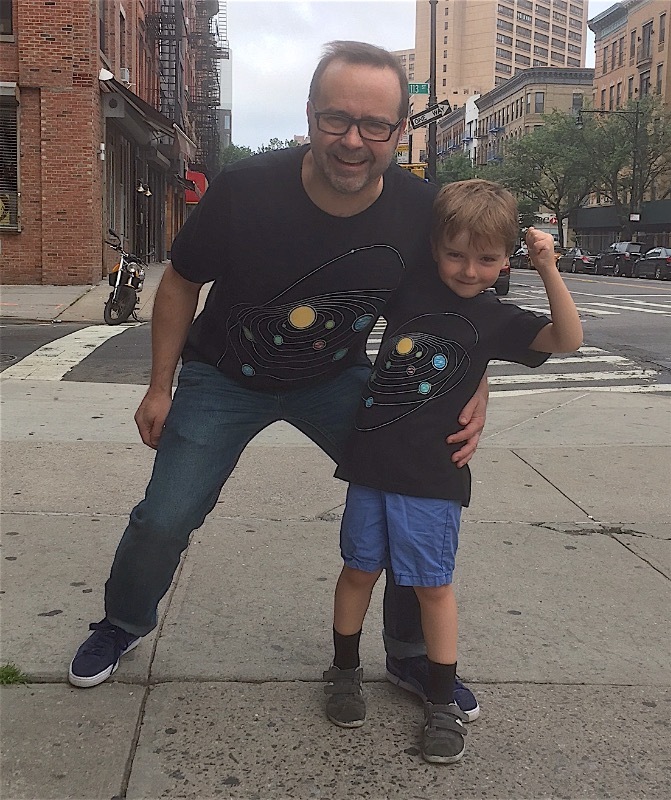 My 6-year-old loves science and this is definitely one of his favorite shirts. I love the quality. This was her choice for our solar eclipse viewing last year. I wore my constellation dress. We both maxed out in fun. The shirt holds up amazingly well for the amount of wear it's getting. My space-crazy 7 year old has been wearing this shirt once a week for month. It still looks great and he loves it. This black, astronomy-inspired dress was designed to capture the magnificence of the stars at night. The stylish flared skirt features functional pockets. The dress features a glow-in-the-dark constellations and stars all-over-print design. Available in adults' size XS-5X. You’ll feel like a shooting star in this gorgeous dress! This black, astronomy-inspired dress was designed to capture the magnificence of the stars at night. The dress features a glow-in-the-dark constellations and stars all-over-print design and features functional pockets. Available in adults' size XS-5X. You’ll feel like a shooting star in this gorgeous dress! Look out-of-this-world with planetary beauty framing your face! An alluring and totally extraterrestrial piece, our necklace was created using photos of the solar system encased in glass domes each depicting the unique qualities of our amazing planets. Every planet is double-sided showing different vantage points. Those who are astronomically smart and stylish will appreciate that the planets are aligned on this sterling silver necklace according to their distance from the sun: Mercury, Venus, Earth, Mars, Jupiter, Saturn, Uranus, Neptune and don’t forget Pluto! For the astronomy loving fashionista, you’ll look super galactic in this colorful, fun and versatile piece! Features 9 planets in our solar system and the Sun! Celestial Nebulae within your reach! Have you ever wanted a rainbow of nebulae hanging about your wrist? In these delicately shaped silver bezels, you can do just that. A celestial celebration, this nebula cuff bracelet is a simple but unique statement piece. With this statement bracelet, you get 9 different nebulae in the ROYGBIV spirit. Each images measure approximately 12mm. It is one solid piece, the nebulae do not separate. These are not 100% waterproof, so please take off before showering or entering a pool. Have you ever wanted a rainbow of nebulae hanging about your neck? In these delicately shaped silver bezels, you can do just that. A celestial celebration, this nebula necklace is a simple but unique statement piece. With this statement necklace, you get 9 different nebulae in the ROYGBIV spirit hanging on an 18 inch chain. If you are over the moon with lunar awe, it’s time to phase in this out-of-this-world necklace. This gorgeous moon phases necklace represents a nine phases of moon. Illuminate your neckline with this astronomy-inspired accessory! Moon Phase necklace is a simple but unique statement piece. Chain length is 18" and each images is approximately 12mm. The phases do not separate. 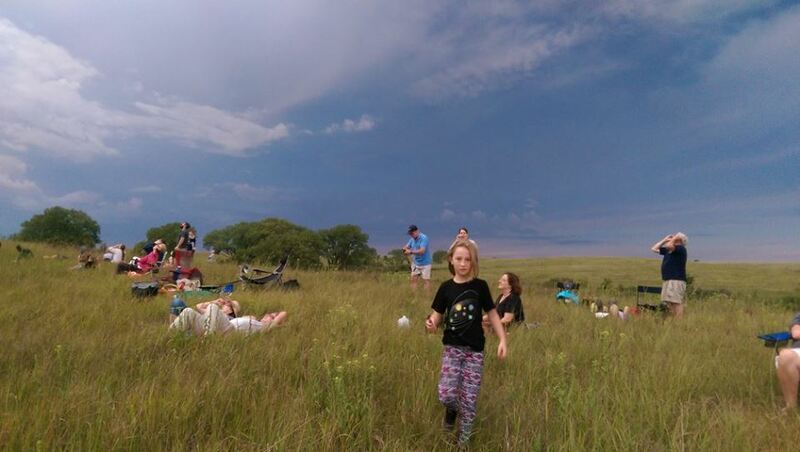 Calling all astronomy-enthusiasts! We've got the perfect gift box to make your feet feel out of this world! When you asked us for more space-themed items, we understood the gravity of the situation. These accessories are the perfect gift for astronomers, aerospace engineers, or for anyone who loves the cosmos! The search for alien life goes on, but you’ve just found a dress that’s sending all the right signals. This design takes its inspiration from the Very Large Array in New Mexico, which along with other observatories worldwide has been scanning the sky for artificial radio signals of extraterrestrial origin for decades. No one has said hello as of yet, but you’re sure to discover some of your own intelligent fans in the lab or in the classroom when you’re arrayed in this fashion! This black, astronomy-inspired dress was designed to capture the magnificence of the stars at night. The stylish flared skirt features functional pockets. The dress features a glow-in-the-dark constellations and stars all-over-print design. Available in adults' size 0-5X. You’ll feel like a shooting star in this gorgeous dress! Reach for the stars in this elegant, glowing, celestial skirt! The wondrous night sky has inspired generations of humans to imagine what lies beyond. We made this skirt as an homage the amazing Cartographer of the Universe, Margaret Geller. She has spent her lifetime dedicated to the unthinkable task of mapping the universe to understand the patterns of galaxies we see today! This black, astronomy-inspired skirt was designed to capture the magnificence of the stars at night. The stylish maxi skirt features functional pockets and glow-in-the-dark constellations all-over-print design. Available in adults' size XS-5X. You’ll feel like a shooting star in this gorgeous skirt! The wondrous night sky has inspired generations of humans to imagine what lies beyond. We made this design as an homage the amazing Cartographer of the Universe, Margaret Geller. She has spent her lifetime dedicated to the unthinkable task of mapping the universe to understand the patterns of galaxies we see today! This Astronomy-inspired design was created to capture the magnificence of the stars at night. Top features a stylish cowl neck and 3/4 length sleeves. You’ll feel like a shooting star in this gorgeous, glow-in-the-dark constellations top! Available in adults' size XS-5X. This black, astronomy-inspired kids twirl dress features an all-over-print glow-in-the-dark stars and a black hole design on bottom corner of the dress with deep functional pockets. Available in kids' sizes 2 yrs-11/12 yrs. Orange leggings included features deep functional pockets as well!